This is the third time in 8 years the city has had to explain its actions to the grand jury. Wildomar does a poor job of informing citizens about volunteer position openings on the Planning Commission and Measure Z Oversight Advisory Committee, so sayeth the Riverside County Grand Jury. In a report made public on June 24, 2016 with a response due by August 20, 2016 the city of wildomar failed to properly post unscheduled vacancies as required by the Maddy Act. 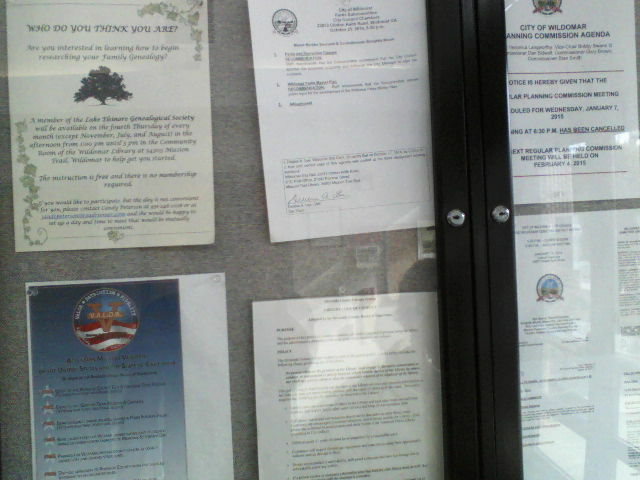 Posting of other required notices at the Wildomar Library and the Wildomar Post Office are also in need of change. secure bulletin board, large enough to display the entire postings. clip board that is unsecured. In 78 Ops.Cal.Atty.Gen. 327, 331-332 (1995), this office concluded that the 72-hour notice requirement mandates local agencies to post their notices in locations which are accessible 24 hours a day for the 72 hours prior to the meeting. Accordingly, notices cannot be placed in buildings which are locked for some portion of the 72 hours immediately prior to the meeting. there are secure bulletin boards available that could be used by the city but someone would need to show up when there is a postal employee present to unlock the bulletin boards. Anytime during normal business hours 8:30 am – 5:00 pm. Monday thru Friday. c. County and municipal agencies. Also Section: 125.361 Bulletin Boards The following guidelines apply to the use of bulletin boards: a. Postmasters may install bulletin boards in public areas of Post Offices or set apart a convenient place to display official government notices, notices of public assemblies, judicial sales, official election notices issued by state or local government, and similar announcements. These display privileges must be afforded without discrimination. 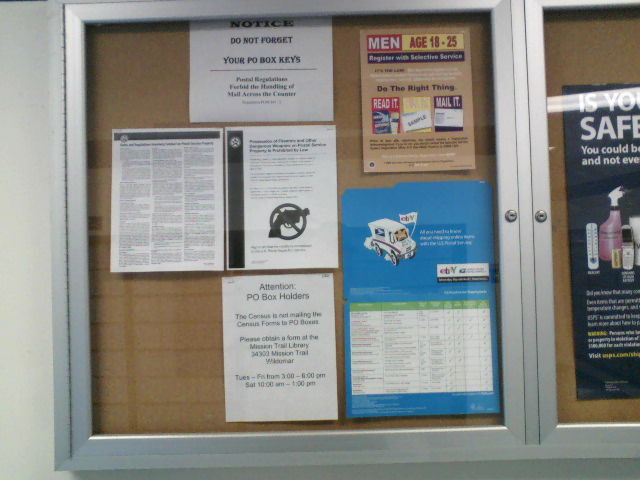 These sections clearly allows for the posting of agendas inside the locked bulletin board. Develop policy and procedure ensuring the city complies with the “Maddy Act” by posting all vacancies at the city clerk’s office, the public library and other designated location(s). The city of wildomar would have to climb down of its high horse and want citizen involvement in the workings of the city. There is much talent to be found in the community but currently if one wasn’t a part of the small group of WIN – Wildomar Incorporate Now members, forget about it. All one has to do to see the reality of this is to look at the past response to vacancies in the Planning Commission and Measure Z Committee where only one or two applications were received for each vacancy, even after numerous request. All this in a town of 35,000 citizens of which more than 18,000 are eligible to hold a seat. This entry was posted in Daily Ruminations, Future City of Wildomar, Shenaigans and tagged Wildomar City Clerk, Wildomar City Council, Wildomar City Staff on July 6, 2016 by Kenny.